AHB students experience hands-on, meaningful & interdisciplinary project-based instruction in reading, writing, science, social studies/history, and mathematics. Our small, mixed-age class sizes and low student:teacher ratios provide the opportunity for increased interaction between teachers and students generally 12 -18 students per class with 2 teachers. This allows teachers to better meet a range of academic needs and to facilitate in-depth, interactive learning. Though we do not use standardized tests or textbooks in the classroom, AHB does have established academic objectives in math, language arts, and social-emotional learning. For science, social studies/history, and fine arts instruction we infuse the relevant skills and content throughout the interdisciplinary projects that provide our students with hands-on and authentic learning. The goal: expose students to major concepts and timelines that spark a lifelong passion for learning. At AHB, there are no standardized tests and no mindless homework assignments. Our teachers and students work together to create projects that require the use of specific academic skills. For example, teams of Gamma & Delta students created model roller coasters which were submitted to a Six Flags contest. This project required students to learn about force, motion, gravity, measurement, etc. Having to create brochures for their roller coasters resulted in concentration on persuasive writing, formatting, and graphic art. Oral presentation skills became essential as the students prepared for “Portfolios on Parade” (an AHB event where students displayed their semester’s projects.) In experiences such as these, learning comes as a result of a student’s enthusiasm and desire to be a part of the application of new knowledge and skills (as opposed to memorization without perceived purpose). Students come away with true understanding of concepts, as well as other vital practice with skills such as teamwork, conflict negotiation, project planning, etc. 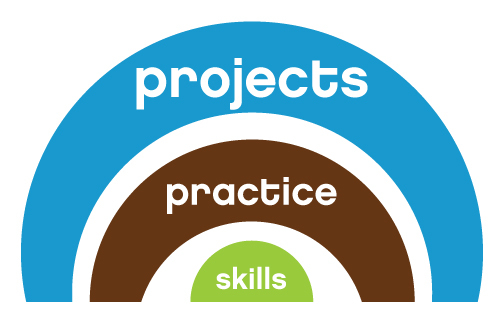 Broadly, most academic and social/emotional skills and standards are met through the use of these projects, but certainly not all things will fit into a current project or be the right way for a given student to best understand a concept. For these moments, and to reinforce skills that require additional practice to develop fluency, we balance mixed-ability interdisciplinary projects with ability grouping for specific practical application practice in parts of math, writing, and reading through the use of a variety of tools such as Math Pentathlon or The Daily Five. When students require more intensive and discrete skills work, a variety of activities can be provided as well. This is true for the AHB classroom and the students’ learning beyond our walls as Projects & Practice make their way home rlych week. We have built our standards, curriculum, and instructional practices off the established and widely heralded work of the greats in the Progressive Education Movement. Below, learn more about the many influences that yielded AHB Community School’s work. Instruction must focus on the child as a whole, for you can never be sure as to where society may end or where that student will be needed or will take themselves. Education is the process of living and is not meant to be the preparation of future living, so school must represent the present life. As such, parts of the student’s home life (such as moral and ethical education) should take part in the schooling process. The teacher is a part of this process, not as an authoritative figure, but as a member of the community who is there to assist the student. Method is focused on the child’s powers and interests. If the child is thrown into a passive role as a student, absorbing information, the result is a waste of the child’s education. Information presented to the student will be transformed into new forms, images and symbols by the student so that they fit with their development and interests. The development of this process is natural. To repress this process and attempt to “substitute the adult for the child” would weaken the intellectual curiosity of the child. Education is the most fundamental method of social reconstruction for progress and reform. Dewey believes that “education is a regulation of the process of coming to share in the social consciousness; and that the adjustment of individual activity on the basis of this social consciousness is the only sure method of social reconstruction.” As such, Dewey sees schools as means to reconstruct society. Students benefit from an environment where teachers and students learn from each other. Students learn best through experimentation, reflecting on the conditions and consequences of action. By contributing to others, students develop their individuality and unique capacities to add to the common good. At its best, a school exemplifies a purer form of our society’s democratic principles so that students grow into adults who improve their world. Teachers, through explorations of new research and established best practice, constantly reflect on the work of their classrooms. 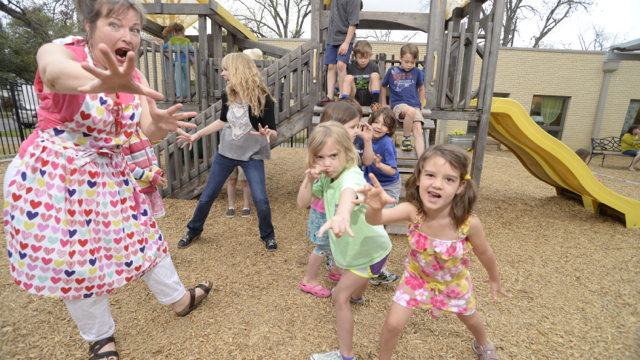 Teachers are dedicated to generating an inner enthusiasm for learning within every child. This eliminates the need for competitive testing, academic placement, and behavioristic rewards to motivate learning. It allows motivation to arise from within and helps engender the capacity for joyful lifelong learning. Children must be able to learn through experiences of touching, moving, listening, seeing, and hearing. Children must have endless ways and opportunities to express themselves (The Hundred Languages of Children). Children are the collective responsibility of the community. Teachers are considered co-learners and collaborators. Teachers give careful attention to the documentation and presentation of the thinking of the children. “Freedom is acquired by conquest, not by gift. It must be pursued constantly and responsibly. Freedom is not an ideal located outside of man; nor is it an idea which becomes myth. It is rather the indispensable condition for the quest for human completion.” According to Freire, freedom will be the result of praxis — informed action — when a balance between theory and practice is achieved. In rejecting the traditional “banking” approach to education (a metaphor that suggests students are considered empty bank accounts that should remain open to deposits made by the teacher), Freire claims it results in the dehumanization of both the students and the teachers. Instead, he advocates for a more world-mediated, mutual approach to education that considers people incomplete. According to Freire, this “authentic” approach to education must allow people to be aware of their incompleteness and strive to be more fully human. A proposal of dialogue as an instrument to free the colonized, through the use of cooperation, unity, organization and cultural synthesis. This is in contrast to antidialogics which use conquest, manipulation, cultural invasion, and the concept of divide and rule. Freire suggests that populist dialogue is a necessity to revolution; that impeding dialogue dehumanizes and supports the status quo. In the classroom, this requires teachers to be in mutual dialogue with their students, both sharing in the co-creation of learning. AHB Community School admits students of any race, color, national and ethnic origin, religion, sexual orientation, and gender expression to all the rights, privileges, programs and activities generally accorded or made available to students at the school. It does not discriminate on the basis of race, color, national and ethnic origin, sexual orientation, or gender expression in administration of its educational policies, admissions policies, and school-administered programs.